Which is the better tire? Every driver asks himself the question one day or another. Only dealers don’t, they just go for the tire recommended by the manufacturer for that particular model. But there are better and/or cheaper tires at tire service outlets, where there is plenty of choice but little information about each tire besides the price. That’s why the European regulators chose to step in by imposing a labeling system. 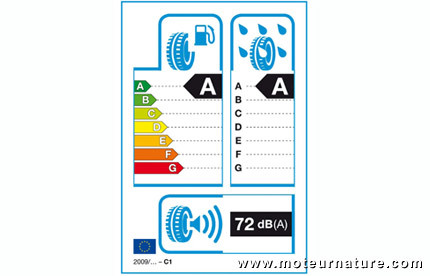 Legislation now requires all tires in shops to carry a sticker with details of their fuel economy, external noise and performance in wet conditions. Ratings go from A (excellent) to F (poor), following tests described in the video below. Obviously, the legislator wanted a labeling system that everyone could understand, but many will miss information about durability, or winter performance. Advice from professionals will hence remain important, as the safety which comes from a well known brand. But the main idea was to inform drivers about rolling resistance, to make them buy tires that lower fuel consumption a little bit. Can it work? Tire manufacturers explain that green tires can increase fuel economy by a few percents. It will not make a big difference for the individual motorist, but at the European level, with about 200 million drivers, the reduction should be significant.